On August 29th, 2009, my grandpa Donald Anderson slipped the bonds of earth and Alzheimer’s, and went home to be with Jesus. I miss him, but yet I feel so at peace knowing that I will see him again and that he isn’t suffering anymore. As the oldest grandchild of Donald and Lorraine Anderson, I have so many memories of my grandpa. Here are a few things I want to share with you about who my grandpa was, special memories I have, and observations from the visitation/celebration service last week. 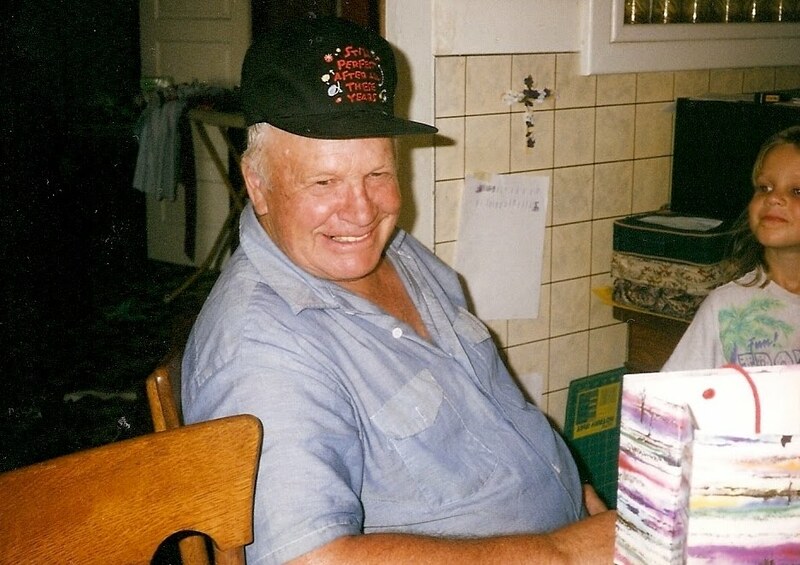 – My grandpa always seemed to have a big smile and a joke. He seemed to genuinely enjoy people, and life. – My grandpa loved his family. He and my grandma were married for 55 years, and lived out the vows “for better or for worse, for richer or for poorer, in sickness and in health, ’til death do us part”. He and my mom and uncles would joke and laugh together and you could tell they had a special relationship. – My grandpa loved his grandkids. One thing that people said to me over and over this last week was, “Your grandpa was sure proud of you”. One of his former pastors shared during the life celebration service that when they would get together for Bible study at my grandparents’ house, my grandpa would go through each picture of the grandkids on the wall and tell the pastor what they were doing lately. It meant so much for me to hear this from other people. – My grandpa loved God. He became a Christian later in life, and it changed his outlook and focus. I don’t remember his faith being showy or loud, but quiet and steady. He was involved in his church, and loved on the the people there especially the kids. He was affectionatly known there as “the candy man”, for always having a piece of candy or bubble gum in his pocket for the kids when the service was over. – My grandpa had a firm handshake, something I greatly appreciate in a person. 🙂 He also had the ability to eat an entire apple, core and all. This is an art I am still trying to perfect. – My grandpa served in the army during the Korean War, and he was pretty proud of this. He would salute us grandkids, and then wink at us. I don’t remember all of his war stories, but a couple stuck out to me. ***Once when one of the commanding officers was inspecting the soldiers, one of the guys hadn’t done a very good job shaving. The officer said, “Next time put a blade in your razor”. ***Someone passed around a pack of cigarettes, but Grandpa couldn’t get his lit. And he never smoked after that. – My siblings and I traveled with my grandparents on different occassions, and my grandpa would tease us and tell jokes. He would also sing to us. Our favorites were “Crawdad Hole”, and one that had the line, “hair of gold, eyes of blue, lips like cherry wine”. When he would sing the latter one, my grandma would turn around all scandalized, and say “Oh Grandpa!”. – Although it was a hard day, the life celebration service for my grandpa was also a precious time. We had more of an informal service, with a picture slide show of my grandpa’s life, memories from the immediate family, an opportunity for people who came to share, reflections from two of my grandparents’ former pastors, and a very clear gospel message. At the cemetary, the Honor Guard performed the military rites, with the folding of the flag and giving it to my grandma, the gun salute, and the playing of “Taps”. I was overwhelmed at that moment with pride for my grandpa and the heritage that he left, sadness that he is really gone, sorrow for my younger cousins who might not have the memories that I do, and joy that my grandpa is in heaven praising Jesus, and one day my family will be there with him!